Who are you trusting in? The Lord reminded me this week that our hope is to be in Him and in Him alone. Others will from time to time disappoint us, reject us, abandon us, wound us, despise us etc. but He remains faithful and true. As followers of Christ we need to keep our hearts open and close to Jesus. He will never disappoint us. For even in our times of discouragement He provides comfort and rest if we look to Him. People can be fickle and at times unreliable but He is not. He never changes. He offers mercy and grace to us all when we come humbly before Him, regardless of our sin. He provides us with strength when we go through trials and tribulations, as we abide in Him. If you have found yourself feeling sad and discouraged as a result of disappointment, run to Him. He will provide the rest and peace you need. Just as we ourselves will stumble from time to time, so will others. When we look to others for our joy, happiness or security we set ourselves up for a great fall. Just as only Jesus can provide salvation, only Jesus can provide true joy, happiness and security. David had such a grasp on this truth as is evident in so many verses in the Psalms. 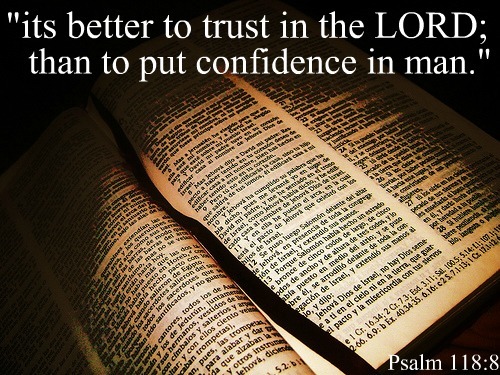 Psalm 118:8 KJV 8 It is better to trust in the Lord than to put confidence in man. Psalm 37:5 KJV 5 Commit thy way unto the Lord; trust also in Him; and He shall bring it to pass. Psalm 28:7 KJV 7 The Lord is my strength and my shield; my heart trusted in Him, and I am helped: therefore my heart greatly rejoiceth; and with my song will I praise Him. Psalm 56:3,4 NIV 3 When I am afraid, I put my trust in you.4 In God, whose word I praise—in God I trust and am not afraid. What can mere mortals do to me? Psalm 18:2 NIV 2 The Lord is my rock, my fortress and my deliverer; my God is my rock, in whom I take refuge, my shield and the horn of my salvation, my stronghold. Remember we are all pilgrims on this journey of faith. We are being changed from glory to glory and will continue to be until we go on to be with the Lord. In the meantime, we will stumble and so will others. You will disappoint others and others will disappoint you from time to time. So let’s put our trust and faith in the One that is worthy of both!